The Jazz Heroes are what the JJA used to call its "A Team: Activists, advocates, altruists, aiders and abettors of jazz." This year's heroes demonstrate the prominence of women and Americans of diverse ethnic backgrounds in support of jazz, the Congressionally designated "rare and valuable American national treasure." Jazz Heroes receive engraved statuettes, presented by JJA members and colleagues at parties, mostly open without charge to the general public. Many receive official proclamations from governments in their locales. 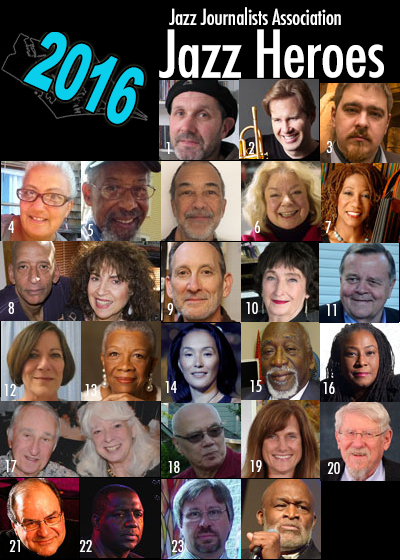 Naming the Jazz Heroes launches the 2016 edition of the JJA's annual campaign celebrating local music people and scenes during Jazz Appreciation Month (which culminates in International Jazz Day), and the 20th annual JJA Jazz Awards for excellence in music and media covering music. Organizations collaborating on Jazz Hero events include A Place for Jazz (Albany), B Sharp's Jazz Café (Tallahassee), the Carr Center (Detroit), the California Jazz Foundation, Eastside Arts (SF Bay Area), Elastic Arts (Chicago), JazzBoston, the Outpost (Albuquerque), the Philadelphia Clef Club, Portland PDX Jazz Festival, the Western Jazz Presenters Network, Westminster Presbyterian Church (Washington DC). The processes for other aspects of the JJA's spring Jazz Awards initiatives are also underway. Nominations for Jazz Awards for excellence in jazz music and journalism are currently being tabulated and will be announced in mid-April on this site. Winners of the Awards for musical achievement will be announced in early May –those Awards will be presented at the winning musicians' performances nationwide. Winners of categories for excellence in music journalism will be announced at the JJA's New York City Jazz Awards party, to be held Tuesday, June 15 at the Blue Note Jazz Club in Manhattan, to be headlined by drummer Herlin Riley's band.